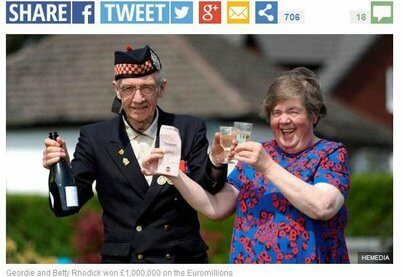 The retired soldier had purchased and Euromillions ticket. After checking his numbers in the main draw, he discarded his ticket in the garbage bin. Fortunately his wife fished the ticket out of the bin for a second look. The retrieved ticket was found to have won in the Millionaire Maker draw. They plan to give each of their six children £25,000, and keep the rest for their sunset years.